Published: Nov. 14, 2012 at 02:26 p.m. Updated: Nov. 14, 2012 at 09:48 p.m. 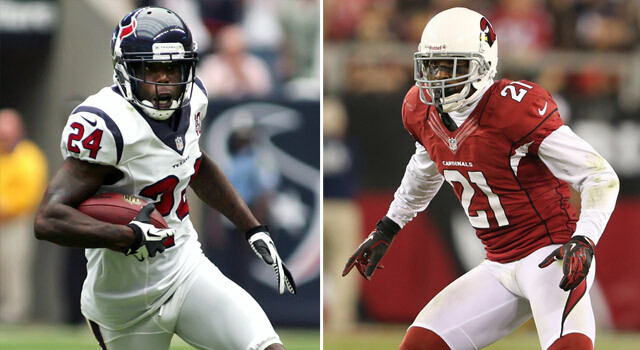 The Texans' Johnathan Joseph and the Cardinals' Patrick Peterson are at the top of the cornerback stack. Competition in the NFL is as intense as it's ever been. Teams are looking for any way to gain a competitive advantage (without, of course, breaking the rules), and statistics are an increasingly important tool for accomplishing that. But statistics illuminate just one piece of the puzzle, especially when it comes to player evaluation. Teams need to look at all the angles, including the numbers, to get the most accurate idea of what's going on. To illustrate that concept, I thought I'd take a look at the cornerbacks in the NFL, first using a narrow statistical analysis and then using a holistic, all-encompassing approach to sift out the top talent at the position. Here are the top six cornerbacks through Week 10 according to their "burn percentage," which shows how many of the balls thrown in their direction have resulted in pass completions (players must have been targeted at least 35 times; anything under 55 percent is considered good). I've also included how many touchdowns they've given up and how they've done in terms of passes defensed. The above list is a valuable list. It provides an accurate snapshot of the best players at defending the pass. But it doesn't paint the whole picture; it doesn't account for all the other aspects -- tackling, forcing turnovers, snagging interceptions -- that factor into great cornerback play. Here is my list of the top cornerbacks in the NFL according to how they've performed on the field so far this season. Only one of the players in the table above made my cut. Burn percentage: 54.1 (targeted 61 times; burned 33). TDs allowed: 1. Passes defensed: 6. Joseph has very good recovery speed. An outstanding athlete and a good tackler, Joseph is very smooth. The former Cincinnati Bengals player was a great free agency pickup for the Texans in 2011. Burn percentage: 64.3 (targeted 42 times, burned 27). TDs allowed: 0. Passes defensed: 5. When Tillman's on the field, he's usually facing the other team's best receiver. He's not the fastest, but he's a very good tackler who can support the run defense. Tillman, who has seven forced fumbles, can create turnovers with contact after the catch as well as anyone I've ever seen. He's a great example of how pass defense is just one part of the game; he seems to give up an exceptionally high number of passes, but that's partially a function of the defense he plays in, as well as his style. Tillman does a great job keeping his man in front of him, so while the receiver might catch the ball, Tillman is right there to stop him and try to force a turnover. Burn percentage: 48.7 (targeted 39 times, burned 19). TDs allowed: 1. Passes defensed: 5. The vertical dimension is very important at the cornerback position, and Bailey has thrived with his exceptional jumping skills. Bailey, who still has outstanding speed at age 34, is a smart player with great cover skills and great route action. He's made it to 11 Pro Bowls, the most ever for a cornerback, and has 51 career interceptions. Burn percentage: 50 (targeted 46 times, burned 23). TDs allowed: 2. Passes defensed: 9. This guy doesn't look like a corner, because he's so big (6-foot-1, 215 pounds), but he's able to keep up with opponents of any size. He's a very talented pro player with very good ball skills, and has great speed and quickness. Burn percentage: 46.8 (targeted 77 times, burned 36). TDs allowed: 2. Passes defensed: 15. Jennings is small, but he can handle bigger receivers in man-to-man coverage. He's quick and has great forward burst; some guys can run, but they don't have burst like Jennings. He's at his best when he can play off the receiver and read and react to the opposing quarterback; he will throw his body around when tackling. Through eight games, he's already got eight interceptions, two more than he'd had in his previous six years in the NFL. Burn percentage: 44 (targeted 50 times, burned 22). TDs allowed: 4. Passes defensed: 6. Undrafted out of Oregon State, Browner had a stint with the Denver Broncos before sticking in the Canadian Football League. He landed with the Seahawks in 2011, and has flourished since. Browner is big and strong, and excels at press coverage; his receivers always have a hard time getting off the line. He can be beaten deep if the receiver escapes from him. Burn percentage: 48.6 (targeted 37 times, burned 18). TDs allowed: 3. Passes defensed: 5. Haden has very good man cover skills and very good ball skills, and drives on the ball. He might have a jokey nickname ("Rock Star") but his game is nothing to laugh about; he plays very tough. Haden did miss four games this season; he was suspended for violating the league's policy on banned substances. Burn percentage: 52.2 (targeted 67 times, burned 35). TDs allowed: 2. Passes defensed: 11. Williams has been scrapping since he enrolled at Louisiana Tech without a scholarship and convinced the coach to let him play. After going undrafted, he had a brief stint with the Houston Texans before being cut and landing with the Packers, and he eventually developed into one of the leaders on their secondary. He's been playing very well this season. He's got great quickness and ball skills, and is always near the play. As you can see, anyone trying to evaluate the state of the cornerback position on burn percentage alone would have missed some great players, like Tillman and Joseph. Taken together, both lists provide an accurate assessment of the top talent, in terms of one specific category and in terms of overall play. Interestingly, two of the household names at the position, Nnamdi Asomugha of the Philadelphia Eagles and Asante Samuel of the Atlanta Falcons, didn't make either list. Neither are playing exceptionally well no matter how you slice it. Asomugha doesn't have a great burn rate (55.3) and he's picked off just one pass; the same can be said of Samuel (55.6 percent burn rate, two interceptions). That just goes to show that, regardless of a player's reputation, scouting and statistical analysis are the only ways to get a true picture of his performance. » I noticed two unsung heroes in Week 10, and both made their mark in special-teams play. St. Louis Rams punter Johnny Hekker once again showed off his arm; the former high school quarterback took to the air on two fake punt plays against the San Francisco 49ers last Sunday, one of which was from the Rams' end zone and both of which resulted in a first down. My second unsung hero, the Dallas Cowboys' Dwyane Harris, returned a punt 78 yards for a touchdown against the Philadelphia Eagles, the go-ahead score that helped the Cowboys notch the win and hang on to their hopes of making the playoffs. » When they beat the Kansas City Chiefs last Monday, the Pittsburgh Steelers won their 15th straight Monday night home game, a streak that stretches back to Oct. 19, 1992. » Five interceptions were returned for touchdowns in Week 10, making 39 for the season, which is the highest number through Week 10 of any year. » Baltimore Ravens kick-returner Jacoby Jones ran a kickoff 105 yards back for a touchdown against the Oakland Raiders on Sunday, making him the first player in NFL history to have returned two kickoffs for 105-plus yards; he also scored on a 108-yard return in Week 6 against the Dallas Cowboys. » Former Texas coach Darrell Royal passed away last week, and the Longhorns honored him in an interesting way: By running the wishbone on the first play of their game against Iowa State last Saturday. This was a clever way for Texas and coach Mack Brown to pay homage to Royal. Many folks use words to describe what someone meant to them; this was a unique way to do the same using the formation that Royal made famous.